In the 32 years since he opened his first store at a mall jewelry kiosk, Brian Levine has counted on ring orders from wedding-bound customers, but more and more he takes custom requests for glittering crosses and other "bling" from people such as the tall man in baggy jeans who hung by the counter on a recent afternoon. While the man declined to discuss his purchase, he was a professional basketball player for a team in Europe, and stood about 6 feet 10 inches. 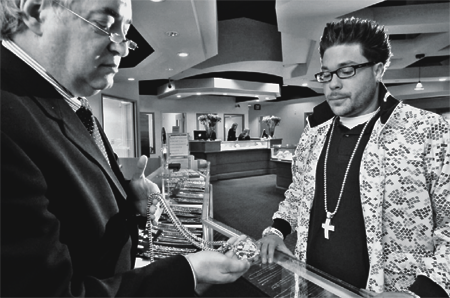 He had come in to Levine's new Brian Michael's shop on Niagara Falls Boulevard in the Town of Tonawanda for a $32,000 cross pendant with 42 carats in diamonds, adjusted to the right length for his lanky frame. The basketball player is among a growing number of men buying jewelry and, as an emissary from the glamorous athletic world, his tastes are the ones that industry analysts say make their way down to the buying public.Levine is wise to cater to such trend setters, said Amanda Gizzi of the New York City based Jewelry Information Center. "He's above the cusp of that market," she said. Levine, who sells sparkling items of all kinds and all prices, has cultivated the business of a group of professional athletes and rap musicians, in and out of town, by word of mouth and by customizing pieces so they look unique. He and the firm's staff add newly fashionable colored diamonds in purple, blue, black and yellow, to pendants. They fashion the gold front teeth coverings called "grills" and sculpt pendant nicknames written in thick diamond-studded gold script. "We handle diversity," said Levine. The basketball player came because his sister, also a customer, said she heard Levine would take care of him. "I said, 'Absolutely,' " Levine said, after the man placed an order for a cross with alternating canary and white diamonds. "So when we make that piece for him, we're going to make it like it was meant for him." Levine has made his way to these glamorous clients by making out-of-the-ordinary custom orders that once included an unusual bracelet of three intertwining gold strands for funk star Rick James. When James, now deceased, was big in the 1970s, Levine owned the jewelry counters in the now-defunct Sample department stores. Levine went on to own three stores in area malls, before keeping one shop open at a Town of Wheatfield mall and consolidating the others in his new 7,900-square-foot place a year and a half ago. "I think what happened is a few people took a chance with us," Levine said. "They're telling their associates and we're getting business." According to Gizzi, doing custom orders and catering to flashy tastes that come with an interest in urban street fashion, is how jewelers can keep their edge. Diamond-loving hip hop entrepreneur Sean "P. Diddy" Combs is among those celebrities credited for a trend that started with rapper glitz and took off with regular folks about three years ago: Men buying jewelry for themselves. "David Beckham has a diamond in his ear that most women would long for," said Gizzi, of the British soccer star. Such flashy celebrity style, from athletes and musicians, filters down, she said. "It helped explode the men's market," Gizzi said of hip hop. "It has trickled down to dads on soccer fields." On the afternoon when the basketball player roamed the store, the Brian Michael's shop had about six men who were in looking at the watch counter. Some looked young with baggy jeans and baseball caps. Others were a bit older in button down shirts. To cater to male tastes, Levine sells diamond watches, titanium rings with Buffalo Bills insignias, and long diamond-studded chains. "We've nurtured it because it's sort of happened on its own. We're sort of filling the void," he said. "I don't remember ever selling the amount of diamond earrings for men that we have currently." A custom shop in China helps keep prices of some of the more intricate diamond crosses as low as $1,500. His own staff of three jewelers also works with clients to tailor orders. Their latest project: Finding a way to use dental molds to make 14 karat gold grills fit more exactly. He has 11 people on the waiting list for the teeth jewelry that can cost from $350 to $6,000 or more with diamonds. The glittering jewels worn by those used to being in front of crowds and cameras is part of what Levine knows people of all kinds want from gold and diamonds -- jewelry that is an extension of themselves. "Aren't we all that way?" said Levine, before an employee went inside the walk-in safe and fetched some recent orders for those with a well-developed flashy side. A bracelet with 48 carats in small diamonds dusted within linked Ks: $60,000. A gold pendant with a nickname Levine preferred not to disclose studded with white and golden canary-yellow diamonds: $9,500. "They wanted it thick, they wanted it heavy, they wanted it flamboyant," he said. "They want what they are . . . That's their identifying mark." One of Levine's local clients who is in the hip hop trade explains why he spends thousands at Levine's shop. "He'll have an eye for what he'll put on me even before I get there," said David DiCioccio, who is on the grill waiting list. Sometimes, for a DVD, or promotional CD mix, Levine will lend DiCioccio pricey jewelry. An $18,000 diamond cross made an appearance on an insert for a CD DiCioccio mixed with material from chart-hitting rappers such as Juelz Santana and the Diplomats. In return, DiCioccio added Levine's shop and phone number near the song listing. Such promotion has helped spread the word about Levine who says he now has hip-hop clients who order from him in New York City. On one afternoon at Levine's shop, DiCioccio wore some of his own glittering collection of white gold and diamonds. In his ears were a pair of square earrings filled with yellow diamonds. On his finger was a matching ring. A cross with 24 carats in diamonds hung around his neck. On one wrist was a link bracelet with 10 karats in diamonds, a silver-dollar-sized watch ringed in white, blue and yellow diamonds was on the other. With his blond hair spiked up and a pair of big white Dolce & Gabana sunglasses with sparkle on the sides, DiCioccio's look seemed to come from a California movie set. "It basically says that I'm willing to express myself and put it to jewelry in a creative way," said DiCioccio, 24, who runs the Cut barber shop and goes by the nickname "Doughboy," a term for someone who is "about their money." "I just work long hours," DiCioccio said. "I don't take days off." Levine, in a dark suit and tie, was a plain contrast. He had no jewelry on. Not a wedding ring, or watch. To him, it makes sense that successful people want to spend on expensive jewelry after they've worked hard to reach the top. Lately, he's been thinking that at 55, he's reached a similar point in his life. He has in mind a ring with a diamond that has a few carats. As he mulls over a setting that he wants to be simple, but fitting, he said, he is like anybody else. "Isn't there a point when you want something special?" he said.